If you had told me ten years ago that I’d spend part of my Sunday herding chickens through a vegetable garden, I never would have believed you. 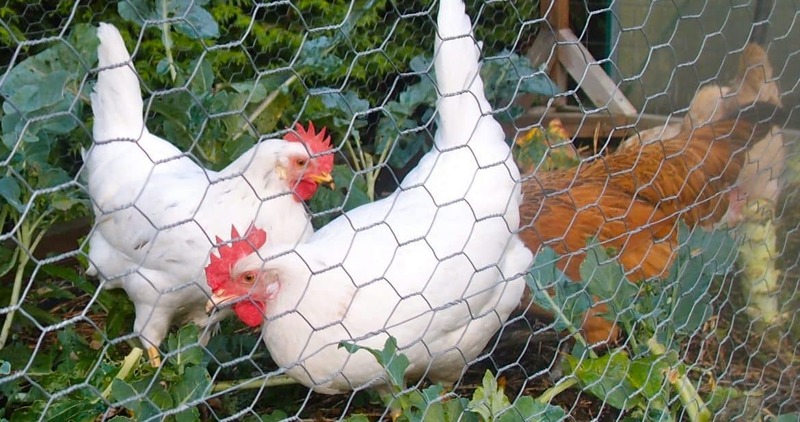 But as I spent part of last Sunday herding chickens through our vegetable garden, something struck me: herding chickens is essentially – perhaps entirely – probabilistic. Gently persuade a hen forward until she reaches an intersection where she can turn left towards the coop or right and back into the garden. Lay out broccoli stems to encourage a left turn, wave your hands to discourage a right one. For all your best efforts, there is no telling what that hen might do. She might go left, she might go right. She might do something preposterous like running back between your legs or heroically flapping her wings to flee into a raised bed. She forces the whole process into a hard reboot or projects the damn adventure out into the third dimension. Either way, your only option is to circle back around and repeat the process. Eventually it’ll work. She’ll turn left, find her friends, and be home for the night. Distilled down, you are repeatedly creating a situation where the hen might choose the path you want. It struck me, last Sunday, how much chicken herding mirrors life: a series of intersections where, by action, inaction, or the intervention of forces beyond our ken, we end up turning left, right, or flapping our wings off into the third dimension. In my own life intersections, sometimes I’ve known what I was doing and sometimes I only realized what had happened years after the fact. Sometimes the intersection took me in a direction I was glad of. Other times I just ended up having to circle back around, sooner or later, to try again. One of the most influential books I’ve recently read was Leonard Molidnow’s “The Drunkard’s Walk.” It interweaves a history of the mathematical science of probability with an exploration of the role that randomness plays in our lives. When Molidnow is not recounting the tales of the gamblers, swindlers, acerbic geniuses, and reclusive parsons who developed the science of probability, he is illustrating examples of how chance influences our lives. Though a physicist by trade, he uses examples from sports (Molidnov is a baseball nut) and Hollywood (he is a part-time screenwriter) to showcase his point. One theme emerges from these stories: the heroes were undeniably skilled, hard working, and possessed of the chops needed for success. But they were not imbued with some divine ichor, skill or talent wildly above and beyond their peers, to which their success could be credited. One: they’d gotten a break, talked to the right person, been seen at the right time, strung together a “lucky” streak. Two: they’d persisted, trying and trying again, creating repeated opportunities until they finally did get the break, conversation, interview, or streak. This week I started a new job – an intersection in life by any definition – and I can already tell that I turned in the right direction. In general, I’ve been a fortunate and successful man. And as I look back on my life, I realize that yes, I have worked hard and taken smart risks and displayed good skills and charm and wit and whatever other qualities helped my odds. But I also know that at every one of these intersections there was, for better or worse, an element of chance – the role of opportunity and the chaos-theory style alignment of events. Watson wasn’t evangelizing sloppy work, he was making the point that only by creating opportunities, taking risks, chancing failure, could success ever happen. Sit around doing nothing, you’ll never fail. But you’ll never succeed either. Take a chance and you might fail. But only by taking that risk do you have even the slightest chance of succeeding. Sometimes you have to go around and around a few times until the dice rolls in your favor, or until the chickens turn left. But with a little luck, and a little perseverance (and sometimes a bit of hand waving), everyone ends up roosting where they should. My comment is not really about this post, but just to say I just recently found your blog and LOVE it! You guys are great writers and thank you for passing on your wisdom, ideas and knowledge. Aspiring – welcome! Thanks for commenting and for reading! Glad you like what we're putting out here. Erica, I laughed at your Nemo quote. I'm also a mom and find myself often quoting from a Pixar movie, a Seuss book or some other child related literature and entertainment to make a point or illustrate a thought. And yes, good post form Mr. Northwest Edible Life. Herding chickens as life lesson. I love this post so much. I used to have one hen who, no matter what I did to herd her, would fly over my head back to where she was just herded from. I feel like my life is sort of like that. No matter how much I try to go in the right direction, I end up right back where I started. It gets exhausting. Hmm… I don't know whether to say good job on this post or not. My husband (the Midwest, meat-eating husband on my blog) tends to think so much like you it's uncanny. I was picturing him when you were talking about herding chickens. Then when you started talking about randomness and probability and that book, I asked him if he had ever heard of the book. To which, he went to his bookshelf and showed me the book. Then he spent the next 30 minutes talking about the book and the randomness of life. Funniest post of the week! !